Today with Disney’s Cinderella arriving on Digital HD, Roku and Android TV are the newest devices that came on board with Disney Movies Anywhere, alongside iTunes, Google Play, Walmart’s VUDU, Amazon Video and Microsoft Movies & TV! Disney Movies Anywhere offers consumers even greater access to their digital collections of Disney, Disney•Pixar, Marvel and Star Wars movies at home and on the go. The story of “Cinderella” follows the fortunes of young Ella (Lily James) whose merchant father remarries following the death of her mother. Eager to support her loving father, Ella welcomes her new stepmother (Cate Blanchett) and her daughters Anastasia (Holliday Grainger) and Drisella (Sophie McShera) into the family home. But, when Ella’s father unexpectedly passes away, she finds herself at the mercy of a jealous and cruel new family. Finally relegated to nothing more than a servant girl covered in ashes, and spitefully renamed Cinderella, Ella could easily begin to lose hope. Yet, despite the cruelty inflicted upon her, Ella is determined to honor her mother’s dying words and to “have courage and be kind.” She will not give in to despair nor despise those who mistreat her. And then there is the dashing stranger she meets in the woods. Unaware that he is really a prince, not merely an apprentice at the Palace, Ella finally feels she has met a kindred soul. It appears her fortunes may be about to change when the Palace sends out an open invitation for all maidens to attend a ball, raising Ella’s hopes of once again encountering the charming Kit (Richard Madden). Alas, her stepmother forbids her to attend and callously rips apart her dress. But, as in all good fairy tales, help is at hand, and a kindly beggar woman (Helena Bonham-Carter) steps forward and – armed with a pumpkin and a few mice – changes Cinderella’s life forever. I liked the message of this movie very much. I was wondering how Disney was going to make this different from the classic animated feature. This is a great family film for people of all ages! I even thought this was better than the Drew Barrymore version, “Ever After”! This movies looks so good! I can’t wait to watch it with my granddaughter. Loved the movie. I like it when movies do printables. I loved this movie so much,Chris and I went to see it when it was at the theater. Thank you for sharing. i dont actually know how i feel about a new cinderella, but my kids are veryexcited. Wonderful! Thank you for sharing the clips, I’ll look for the activity sheets. I just got the cd soundtrack that is the score album of the movie! It’s really beautiful. I was pleasantly surprised. I had no idea I was going to love it so much! Imagine how happy I was when I learned that they added new interpretations of classic songs that were from the original animated film! Ooooh Thanks for these! 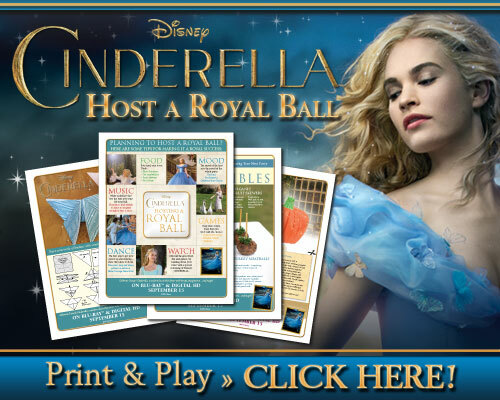 We love the new Cinderella Movie – it’s awesome! That was such a beautiful movie. My daughter hasn’t really been interested in this movie but maybe if we make it an “event” she will get excited . I really enjoyed this movie – it has a great message. My nieces will love the activity sheets! Oh my grand daughter will love these! Thanks for sharing. I can’t wait to see this movie and want to get it for christmas. I love the activity sheets. Thanks for sharing. My niece will just adore this. You are so mice to help these be available to make life so interesting for the young ones. I always loved reading Cinderella when I was a little kid, this looks like a good movie (as usual from Disney)! I am still waiting to see this movie, but I do want to watch it with my granddaughters, I have watched the videos of this and it such a beautiful movie to watch.. so definitely looking forward to that day.. This is such a classic. You don’t have to be a kid to love Cinderella! I loved this version, especially the ball scene! A fun movie for the young girls, nice fashion. I really love these activity sheets, thanks a lot for sharing! I remember watching the original Disney version when I was little and hating the Prince! I thought he was soppy! I finally was able to see this movie, Oh wow! this was so well put together, Love all the costumes and the music behind everything was really beautiful! I was initially unhappy with the casting choice of actress Helena Bonham Carter as Cinderella’s Fairy Godmother.She is usually known for much more offbeat choices, like the villainess in the ‘Harry Potter’ film series. But, she does a surprisingly good job at being kind and sympathetic here. I enjoyed her performance very much. The decision to de-age her character was interesting. I must admit, the new interpretation of her costume was quite beautiful. Thanks for posting the link to the Activity Sheets. Great accompaniment to the movie for Grandkids! This was a good movie. My grand kids like the activity sheets. Was just talking about this movie with a friend who teaches middle school. She said her kids loved it.